Six months ago, Hanna Lottritz planned on having a fun day out with friends at a music festival. She blacked out before midnight, and woke up in the hospital—to find that she had been in an alcohol-induced coma for two days. Lottritz, who turned 21 earlier this month, wrote a poignant blog post sharing her story. Buzzed from having a couple of beers at the Night In The Country music festival, she decided to try to outdrink a group of friends who were drinking hard liquor. Lottritz does not remember the rest of the night, but friends tell her she chugged an entire solo cup of whiskey. She assured the group that she felt fine, but collapsed shortly afterward. Her quick-thinking friends took her to the festival's medical tent, where she was intubated and airlifted to Renown Hospital in Reno, Nevada. 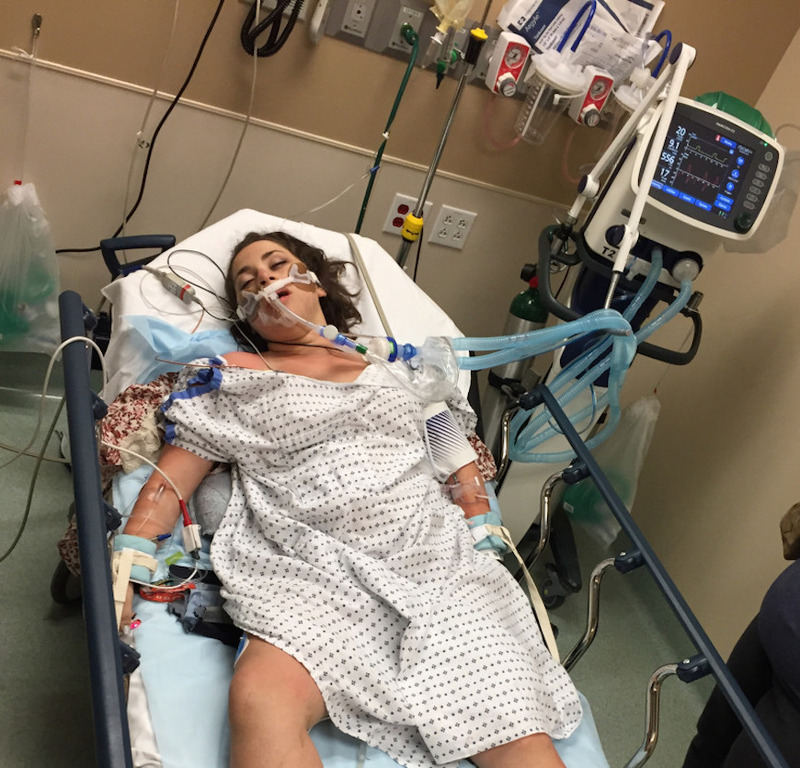 "I was in critical condition, suffering from acute respiratory failure and acute alcohol intoxication," she writes. "My blood alcohol concentration was .41 when I arrived at the hospital, five times over the legal limit. The doctors thought I was brain dead because I was completely unresponsive. My pupils were sluggishly reactive, I had no corneal reflex and I wasn't responding to verbal or painful stimuli." She shared a chilling photo of herself taken just hours after being admitted to the hospital, showing just how dire her situation was. Lottritz woke up 24 hours later, and medical staff told her that she was lucky to be alive. "They told me that they didn't think I would make it through the night," she writes. "They asked me if I was trying to kill myself by drinking so much. This question hit me the hardest. From my hospital bed in the Intensive Care Unit, my eyes were opened to the seriousness of being irresponsible with alcohol. The next day when I was discharged from the hospital, I realized that the way I looked at alcohol would be changed forever." In the blog post, Lottritz credits her friends for saving her life, and stresses the importance of drinking responsibly and looking out for others. "I had good people around when all of this took place. I could have easily been taken advantage of when I passed out. I could've been left alone to 'sleep it off.' I can't tell you how many times I've heard the phrase, 'Let them sleep it off, they'll be fine in the morning,' but I'm alive today because my friends got me help. Don't take a chance if you see a friend passed out from drinking too much. Get them help as soon as possible. I'm very lucky to have made a full recovery, but I know there are others who won't be as lucky." Bravo to Hanna for sharing her story.